We are one month away from Wendy’s annual shareholder meeting, in which the company’s Board of Directors — including Board Chair Nelson Peltz — and executive leaders will gather with shareholders to share updates, graphs, and rosy indicators from the fast food giant’s past year of accomplishments and milestones. But rest assured, shareholders will get an earful about much more than the company’s annual earnings. 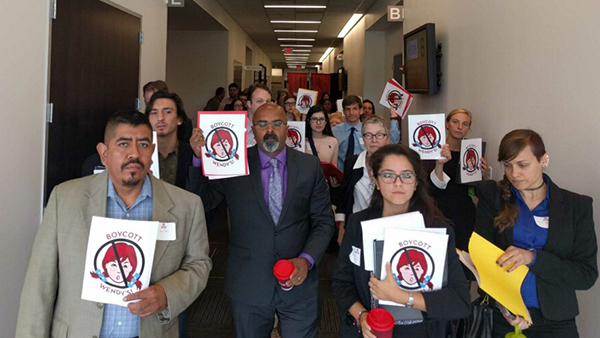 Because, since the last annual shareholder meeting, the national Wendy’s Boycott has not stopped growing… on the contrary, it is stronger than ever. Just two months ago, two thousand supporters joined the Time’s Up Wendy’s March, taking to the streets of New York City alongside nearly one hundred workers and consumers who fasted for five days outside the offices of Nelson Peltz. Across the U.S., over a hundred thousand consumers have committed to boycott Wendy’s until the fast-food giant joins the Fair Food Program. Meanwhile, Wendy’s has been slammed on social media and in the press, with news of the boycott reaching tens of millions more consumers as Hollywood stars like Alyssa Milano and Amy Schumer defended CIW following the fast food chain’s offensive comments about farmworker women “exploiting” the #MeToo movement. And, in the last year, Wendy’s has doubled down on its dubious and expensive public relations strategy of disparaging the Fair Food Program and farmworkers themselves, and at the same time, the fast food chain has attempted to pull the wool over the eyes of consumers (and its own shareholders) with a sham supplier Code of Conduct, which, executives would have you believe, is strong enough to combat the widely-documented gross human rights abuses in their supplier of choice, the Mexican produce industry. On June 5th, farmworkers and their allies will confront the company’s series of unscrupulous actions — from declaring that farmworker women are “exploiting” the #MeToo movement to refusing to support a program that PBS Frontline called “unique in the country” in its ability to fight sexual harassment — and will not leave without an answer: Why will Wendy’s not join its competitors on the right side of history, and sign a Fair Food Agreement? And for executives like Nelson Peltz, there will be no more glass walls behind which to hide. To make this action a success, we need allies around the country to step up in support! Let’s use the month of May to keep the pressure building on Wendy’s head of the June showdown! 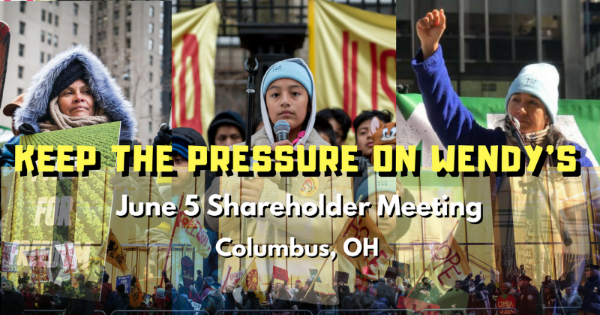 1) Make your plans to join farmworkers, Ohio Fair Food and allies from across the country on Tuesday, June 5, for the major protest outside of the annual shareholder meeting! Housing will be provided for those coming from out of town. Get in touch with us at organize@allianceforfairfood.org for support in planning the trip! Join the farmworker community of Immokalee in speaking truth to power, and standing strong in this critical moment of the campaign. 2) Commit your support to paper and send a hand-written letter to Wendy’s CEO Todd Penegor and Board Chairman Nelson Peltz, then organize your community, congregation, or student group to do the same (make sure to post a photo to social media of your letter)! Send your own powerful message to Wendy’s about why consumers have joined with farmworkers in this movement. Download more instructions here to get set to send your letter to One Dave Thomas Blvd., Dublin, OH 43017. After such an eventful spring, there is no room left for doubt: the national Wendy’s boycott is building steadily towards the inevitable tipping point we’ve seen with numerous other massive corporations in the past 17 successful years of the Campaign for Fair Food: This is Wendy’s moment to step back, take stock, and change course by joining the Fair Food Program — or, face a boycott that is continuing to grow stronger every day, without end in sight. Let’s send the message to Wendy’s leadership: In the 21st century, consumers demand more from companies where they buy their food — we demand real social responsibility, not more public relations smoke and mirrors!